People can easily open jan dhan account in any bank branch or with business correspondent (bank mitr). If any person does not possess the officially valid documents then he can open small account subject to the jan dhan yojana rules. Moreover, people can also avail jan dhan yojana loan through any bank. People can avail all the jan dhan yojana benefits through pdf download of the application form and opening an account. In these accounts, there is also a facility of Rupay Card, Kisan Credit Card (if eligible) and an overdraft (after 6 months of account opening and successful operation). Fill in all the necessary details along with the nominee details. People can avail nomination facility at the time of account opening. 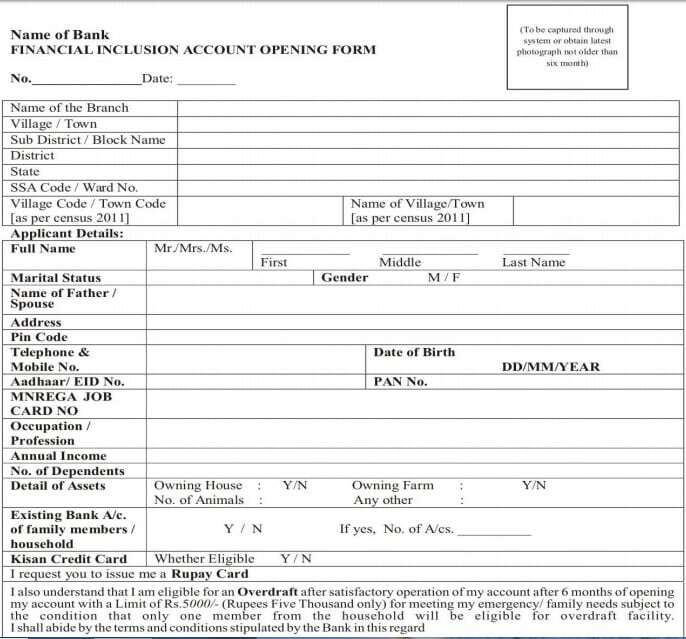 Finally, candidates can submit this form along with necessary documents to open their zero balance account. All the documents given below are officially valid documents. Candidates can submit any one of these documents along with their recent photographs and filled application form to open PMJDY Account. Any other document notified by central govt. in consultation with regulator. To verify a person’s identity, identity card issued by state / central govt. departments, statutory or regulatory authorities, PSUs, Scheduled Commercial Banks, Public Financial Institutions and Letter Issued by Gazetted Officer can be treated as valid documents. 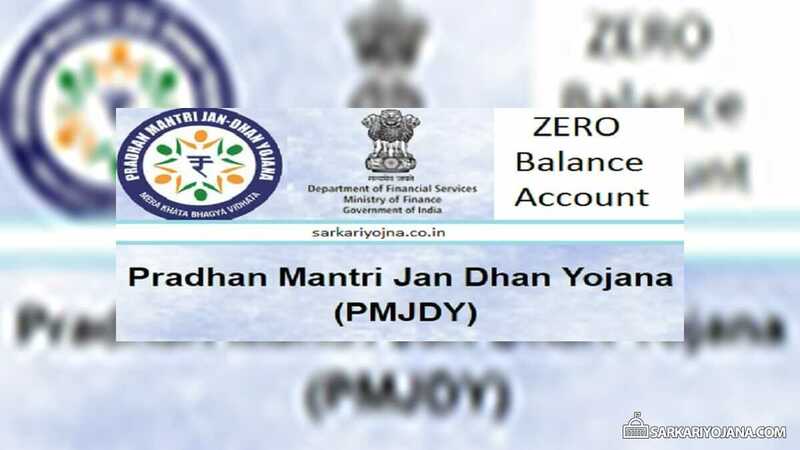 Jan Dhan Yojana Account can be opened with 0 balance. But to avail facilities like cheque book, people have to maintain minimum balance. As per RBI notification, all the people who does not possess officially valid documents can open “Small Accounts” with banks. For this, poor people needs to provide self attested photograph along with his signature / thumb impression in the presence of bank officials. People cannot deposit more than 1 lakh rupees in their account in a single year. The maximum amount that can be withdrawan from a jan dhan account is Rs. 10,000 per month. Maximum balance in Jan Dhan Accounts can never be more than Rs. 50,000 at a single point of time. Such account remain valid for 1 year or 12 months. These accounts will get continued for another 1 year in case the account holder submits a document as a proof that he has already applied for officially valid document within the first 1 year of opening small account. Jan Dhan Yojana Account provides Interest on Deposits. People will also get an accidental insurance cover of Rs. 1 Lakh. Initial deposit and Maintaining balance is zero in this account. All the account holders will get life cover of Rs. 30,000 payable at death of beneficiary. This yojana account provides facility of easy transfer of money across the country. People will get benefits of various government schemes directly through Direct Benefit Transfer (DBT) in this account. All the candidates who have successfully operated their account for 6 months will become eligible for Overdraft facility up to Rs. 5000. People will get access to pension and other insurance products. — In case of further query, please call National Toll Free Number: 1800-11-0001 or 1800-180-1111. Padna chahta hu sir par..
pls tell me why the account holder cannot deposit the amount directly into the bank neither he/she can withdraw any amount directly from the bank. Is there any rules for that because the sbi (mundka branch) bank refuses to do so.I have to do it online or any similar way .it is so frustating. pls reply,Thanking you.